Whether or not you ever dip your toe into the ocean, you’re going to love surfer baby bedding and decorations. The easy, breezy days at the beach watching the girls and boys riding the waves on their colorful surfboards make us want to take those happy memories home with us, don’t they? Surf theme decorations for a baby’s room have never been cuter or as easy to find. Surfer baby bedding sets for boys and girls are a DIY decorator’s dream. So, now if you’re ready to ride the waves I’m sure you want to know, "Where can I find surf décor for babies?" The answer is pretty simple, surf and tropical beach decor are practically one and the same. 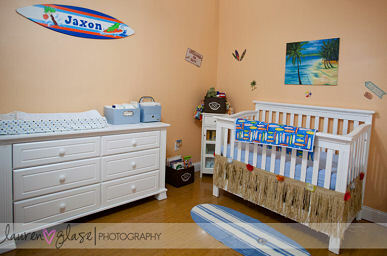 Surfer baby nursery themes are similar to ocean themes but with more surfboards and less sand. You might consider a surf nursery simply as a beach or an ocean theme with a twist. Surfboards, a surf theme crib mobile, and a surf nursery bedding set would easily convert any of the following baby room themes to a surfing theme. All of these sand and surf based baby nursery themes can be completely transformed with the addition of a few decorative accessories. 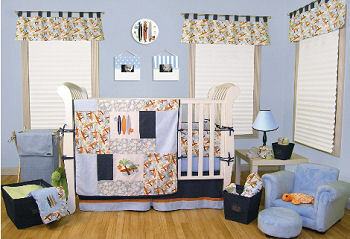 Baby boys crib sets in bright and colorful prints give you a chance to break away from baby blue or at least to bring some other bright, primary colors out in front in your baby’s room. Baby girl’s nursery bedding in a surfboard theme combine classic pink with chocolate brown and any number of other exotic colors covered in hibiscus flowers as well as stripes. Surfer baby themed decorations range from wall clocks to floor pillows. There’s no lack of store bought gifts that you can get that have surfboard motifs painted or engraved on them if you like a shiny, modern surfer baby décor. 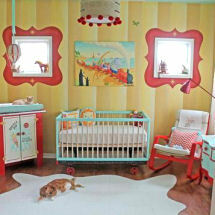 I admit that I enjoy the challenge of creating vintage surf baby nursery décor. The colors are not the bold, primary colors that you find on new surfboards, but used boards have a rich patina that only time can give. For more information on baby surfer nursery decor, return to Unique Baby Gear Ideas.